New Zealand Warriors (formerly Auckland Warriors) is a professional rugby league football club based in Auckland, New Zealand. They compete in the National Rugby League premiership which is Australasia's elite rugby league championship. 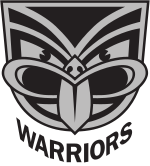 The Warriors were founded in 1995 as 'Auckland' as part of the Australian Rugby League's expansion. The original Warrior's logo was designed by Francis Allan of Colenso. As a result of the Super League war they left the ARL to compete in the Super League competition in 1997 before joining the newly-formed NRL the following year. The Warriors made it to the 2002 Grand Final but have yet to win a premiership. They are based at Mt Smart Stadium in Auckland. The Auckland representative side was consistently providing top opposition to touring sides. An Auckland team was admitted into the mid-week ARL Amco Cup competition in 1978. In their first year they made the semi-finals, and were defeated by the overall competition winners, Eastern Suburbs. They remained into the competition until the early 1980s. In 1987, an Auckland side toured Great Britain and claimed wins over powerhouse clubs Leeds and Wigan. In 1988, serious investigation into an Auckland team entering the New South Wales Rugby League premiership commenced, encouraged mainly by the Mt Albert club. On 17 May 1992, the announcement stating an Auckland-based team's entry into the Australian Rugby League competition, the Winfield Cup in 1995, was made. This followed very good turnouts to a number of NSWRL club games played in Auckland. The new team was to be called the Auckland Warriors and run by the Auckland Rugby League organisation. The original colours selected were blue, white, red and green. Blue and white are recognised as the colours of Auckland, while red and green were the colours of the Warriors' original sponsor, DB Bitter.